QuantumCoupons is a new clone of a newly emerging useless ad-supported program family that includes FreebieForth, Weather Do, and SecretCreditCard, which are some of the latest variations that have hit the web lately. This adware may sound like a useful application by its name and you would assume it will show you coupons for shopping sites. Instead, this is an unreliable desktop program that loads specific websites and may also open browser windows with third-party advertisements. You should be aware that clicking on any content related to this adware may be potentially risky since you may end up on malicious and fake websites. What’s more, it is quite likely that the presence of this program indicates that there are other malware infections on board, too. All in all, if you find this adware on your PC, it is clearly not a good sign. You need to act fast to patch up the holes on your system security. We advise you to remove QuantumCoupons as soon as possible and do similarly in the case of any other potentially harmful programs you may find. 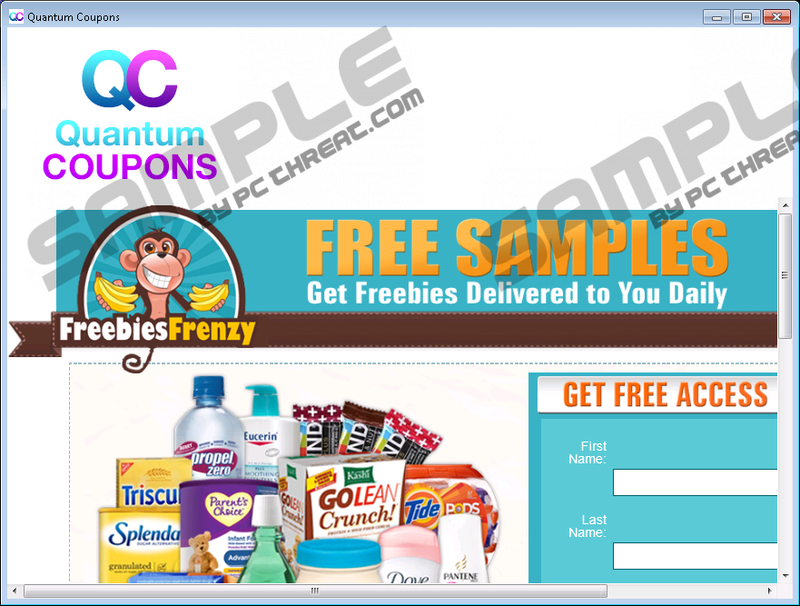 If you are looking for daily coupon offers, you might end up on the promotional webpage of this adware at quantumcoupons.com. You should know, though, that when your computer is protected by security software, you cannot even finish loading this page in your browser as it gets blocked right away as a potential threat to your PC. Now, this is not the kind of experience you are looking for when you are about to install an application. We believe that this webpage is flagged because of the installer it hosts. We have found that this official installer actually bundles a number of malware infections, including Search Know, Sweet-page.com, and MyPcBackUp. These infections can change according to location or even with time passing. You can see that even if you install this program officially, you may allow a number of adware programs, browser hijackers as well as potentially unwanted programs. That is why we think it is vital to double check on an application you are about to download by running a quick web search. You may easily find several articles on how and why you should remove QuantumCoupons. That would be a good warning about the reliability of this application. We do not think that too many computer users end up on this official page, though. It is much more likely that you get infected with this adware through alternative and more questionable channels. For example, you can download this program by clicking on unreliable third-party advertisements, mostly download offer pop-ups that are generated by suspicious file-sharing websites or adware programs that previously infected your PC. Another possibility is that you click on modified search results. It can happen when there is a browser hijacker on your computer. Such a malware infection is capable of altering search results by injecting affiliated advertisements and sponsored links, which you will not be able to differentiate from the normal results. Clicking on any of these ads and links mentioned before can result in downloading this adware. However, it also means that your computer is infected with other malware applications. Therefore, we recommend that you remove QuantumCoupons and identify all potential threats in order to be able to act in time. Leaving the slightest threat source on your computer can endanger your virtual security and your privacy as well. When you start up this program, it opens its own GUI that shows a relatively big logo at the top and loads a specific promoted page below. You can find, for example, musicrule.com/choose.php in this window, which seems to be an events guide of some sort. But there could be other promotional pages as well that show up. However, this application is not a browser so you will not be able to do too much. The question is, why would you not use a browser instead if you are looking for any information? Who would use a potentially unreliable application that is limited to showing specific pages only? This adware may also open an Internet Explorer window from time to time and load freebiesfrenzy.com or similar advertising-related sites that host potentially harmful third-party ads as well. Clicking on any content this adware offers you would be risky since you might be redirected to an unreliable or even malicious websites. This is one way for computer users to infect their system with more malware programs or become a victim of an online scam. If you do not want to find out how your visit to such bad websites would end, you should not hesitate to delete QuantumCoupons from your PC. Finally, we can tell you some good news. As a matter of fact, there is something about this adware that actually works fine, and it is the uninstaller. Locate this uninstaller in the list of installed programs and activate it. That is all you have to do to end this annoying ad-supported program. Please use our instructions below if you are not familiar with uninstalling a program. If you want to protect your computer from future malicious attacks, you should be careful with choosing what websites you visit and what kind of advertisements you click on. But the best solution would be for you to install a reputable malware removal application that would automatically take care of all known infections. Tap Win+Q and type in Uninstall a program. Hit the Enter key. Quick & tested solution for QuantumCoupons removal.